If you consider yourself to be quite the skier, you will agree that one part of your clothing that you can’t afford to disregard is your base layer. Base layers are important when it comes to regulating the body’s temperature so you stay dry and happy while hitting the slopes. Base layers come in many forms from tops to leggings, tights, bras, briefs and more. Some have a “next to skin”, others are loose fitting. That’s why it can be rather overwhelming to shop for base layers especially if it’s your first time. There are too many different brands, types, features and options to choose from so how can you be sure exactly which base layers are right for you? 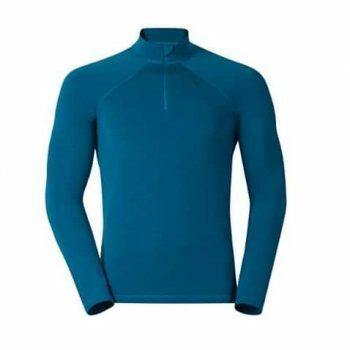 In this article, we have provided a brief guide about the ideal features to look for when shopping for the best base layer for skiing. Plus, we have reviewed a number of garments which you can take as our personal recommendations. Let’s get to it! In order to get a high-quality product, people have to know what characteristic is more important than the rest. 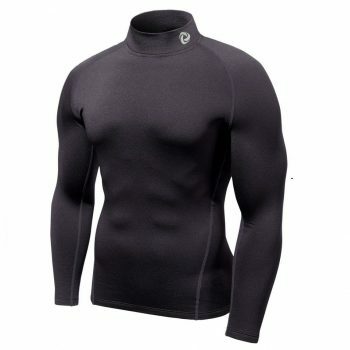 Read on if you are willing to know what those features are so you can buy the base layer that meets your needs. Even though cotton is an inexpensive and comfortable fabric, it is more likely to find people using it during summer because of its sweat absorption and quick drying ability, but, since it tends to retain moist, it is not the most recommended fabric for winter. However, merino wool and synthetic yarns are kings in this regard. Additionally, other fibers have been combined with this type of wool to create a new type of fabric that transports all body humidity to the exterior. This new type of fabric is called wicking, and it is being used for many different garments. These fabric provide a soft feeling, are very stretchable, regulate moisture better and other fabric, and don’t wrinkle; however, merino wool is softer than synthetics. When it comes to smells and stains, Merino is basically unaffected by them while synthetics need to be constantly washed to avoid odor build up. As far as washing goes, wool can shrink if one doesn’t follow the instructions – this is not the case when it comes to man-made fibers. The weight of a fabric simply means how much one square meter or square yard weighs, and determines when it is the most appropriate time to wear the garment. There are three denominations used: light, mid, and heavy, however each manufacturer will classify their fabrics a bit different. What you need to know is that lightweight fabric is thin and can also be used as single layer. You’ll be wearing this type of fabric for mild and cool temperatures if you run, climb, or even cross country. Midweight garments can be worn over lightweight ones for improved insulation and wicking properties. The heavyweight fabrics can be worn over either or both of the previous materials, for the desired or needed body temperature. This weight is best suited for cold weather, regardless of the amount of activity you’ll be facing. Heavyweight garments are generally looser to allow more layers under, and as not to restrict movement. Tops with Bottoms or a One-Piece? The inner layer tops designed for skiing have long sleeves. The bottoms designed for this winter activity are 3/4 in length, also known as capri length. This cut is designed like this to avoid bulking in the snow boots. Also, there are one-piece inner layer garments. They usually have a hood that makes it warmer because all warmth your body procudes stays trapped under it.. Some models might have a thumb hole for increased hands protection. However, one-piece base layers have a few downsides. The first one is that, due to its size, cleaning it might be difficult. Additionally, using the toilet will require you to remove the entire thing, which takes time that you might not have, if you know what I mean. Newer models, however, have a zipper around the waist that makes things easier. Of course, you will want a base layer that fits you best. Snug-fitting layers mean that the generated warmth of your skin will be kept close to your skin which provides comfort in cooler conditions. However when the conditions are warmer, you want your underwear to be loose or risk overheating. A looser layer means better air circulation and more comfort for you. If the layer is advertised as “athletic fit”, keep in mind that the fit will most likely be snug. Winter activities like skiing are known to be strenuous activities. Add that to the fact that exposure to cold temperatures can weaken your muscles and make them more prone to injury. Base layers are designed to keep your muscles warm. In some cases, base layers can also keep you cool. Many base layers have some sort of temperature control features like evaporating warm sweat from the body. Obviously, the more temperature features a garment have, the more expensive it can be. We are sure that with the previous information, you are ready to select the base layer that will fulfill your needs. For that reason, it is time for us to introduce you what we believe are the best products in today’s market. Description: If you need a long sleeved shirt for your sport activities, you might have just found it. 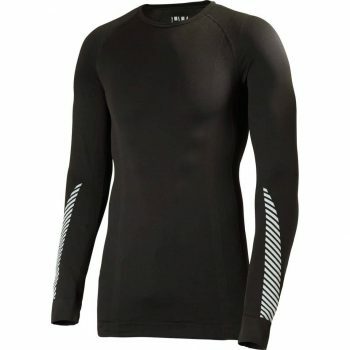 This Helly Hansen Men’s Dry Revolution Long Sleeve is very breathable and lightweight, which is basically what most people want to wear during exercise. The long sleeves protect your arms against the cold, but still keep your body comfortable. The upper part of the shirt was designed to be body fitted, which allows you to show off your figure. In addition to this, the shirt is not only suitable for a run or hiking but also for a variety of activities around the house thanks to its stretchable polypropylene fabric. Also, people say that apart from being very breathable, it also provides goof odor control. You can wear it on any type of weather because it does not retain moisture and it has good insulating properties. The stretchy material is soft at touch, and the Lifa Stay Dry technology enables you to stay comfortable all throughout the day. Users have said that the shirt is true to size and that it fits more body shapes. Related: The Helly Hansen Crew Midlayer Rain Jacket is another great choice for you if you are planning to spend time in humid weather. The fabric used in this piece of clothing is polyester, which guarantees water and wind protection while also providing breathability, it has adjustable hem and cuffs, and it comes with hand warmer pockets and fleeced lined collar. Description: The Helly Hansen Men’s Dry Revolution Pants is the ideal item to take on a ski trip to the mountains. The item has a tight fitting and good insulating properties, which will keep you safe from the cold. The pants are made of polypropylene, a fabric that works great throughout the year in pretty much every type of adventure you’re on because it will keep you cool during summer but warm in winter. Their shape is ideal for virtually any body type thanks to the stretchy material. Also, you will not have to worry about sweating while exercising as the pants feature the Lifa Fiber technology. They offer solid protection against the elements, but are also breathable, so you can wear this pair of tights under another pair of pants, or on their own. The pants are seamless and very lightweight, which provides a comfortable fit while using it, which is a requirement for most hikers and campers. In fact, people who have bought this pair of tights have claimed that they are so comfortable that they barely noticed they had them on after a while of backpacking. Related: For cotton lovers, the same company has created the Helly Hansen Dry Fly Base Layer Pant. As we mentioned before, it is made completely of cotton with the Lifa Dry technology to provide a warm feeling while also providing enough breathability to enjoy the outdoors. It has a next-to-skin fit and, thanks to the material, it does not feel itchy or uncomfortable. Description: Most people find the Tesla Thermal WinterGear Baselayer a very fashionable and attractive base layer because it comes on many different colors and designs to help you make a difference from the rest. In fact, there are so many choices to select from that you could spice things up by wearing this piece of clothing by itself, though using it under a vest is more recommended. This garment is designed for winter as it is lined with fleece – there’s virtually nothing softer and warmer than this. Let’s not forget that the fleeces work as a great insulator even when they are wet, and they dry really fast, which is a feature that many folks are searching for. This garment is designed to meet the needs of athletes and the general public alike. The manufacturer recommends getting a size up because the garment is really tight, however not everyone is bothered by this feature. Also, since it is made of 87% polyester and 13% spandex, it can be stretched to fit pretty much any type of body. If that is not enough, they did make sure to offer a wide range of size options that goes from extra small to triple extra large. 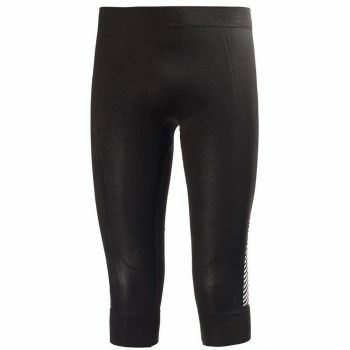 Related: Just as the previous item, the Tesla Men’s Compression Pants come in a wide range of colors and designs to choose from, which is one of the aspects that most people crave for when buying base layers. They are made with durable, elastic and non-abrasive material that has anti-microbial deodorization to enhance odor control, two-way air circulation and quick time dry technology. Description: This is one of the most versatile tops you can wear when you are exercising since it doesn’t really matter whether you are going on a hiking trip, or an alpine expedition, the Odlo Revolution Top has brushed fabric inner and a high collar that will keep your neck, arms and upper body protected against cold temperatures. The top is made of polyester mixed with soft merino wool, which are materials that have great insulating and wicking properties. Thanks to the wool, this top won’t become smelly even if you wear it several days in a row. Along with that, the jacket includes a half zipper which can be undone if you need to let your body breathe more. Users have said that one of the best characteristic this top has is its soft and non-irritating feeling you get while using it. Additionally, thanks to the combinations of the fabrics we mentioned before, the top is very durable, stretchable and breathable; for that reason, it would definitely hold several uses in the most challenging conditions. Related: Another great recommendation that Odlo has to offer is the Odlo Long Sleeve Crew Neck Shirt. It is made of 100% polyester which makes it ideal for runners, hikers, backpackers and pretty much any other physical activity. Also, it provides a good thermal insulation, has odor prevention, soft and warm inners to enhance comfort, and a fit that most people find adequate for them. 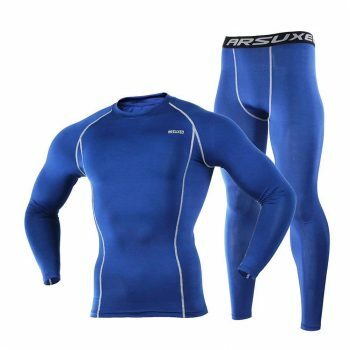 Description: If you need a set that will keep you warm and protected against the elements, check out the Timeiya Elastic Dry Base Layer Set. The set comes with a long sleeve shirt and tight pants that are both made of 88% polyester and are 12% spandex. This combination provides extra comfort during physical activity and exercise while also keeping you warm in cold temperatures. In addition to this, the pants offer ease of movement and breathability, giving you enough comfort throughout your ride. This set provides muscle support, and help you avoid getting injured while exercising. The body fitted shape is ideal for running, but thanks to its soft internal fibers, it is also great for camping and winter mountain expeditions. The set can be worn multiple times in a row, as the material is chemically treated not to retain odors. If you need extra protection against the cold, you should know that these items can be worn under any other garment. Finally, the trendy colors and fashionable design will attract all sights no matter what you would use them for. Related: With the Timeiya Thicken Warm Jacket you would not have to worry anymore about expeditions during winter. It is a very warm piece of clothing that can be worn on the base layer we just mentioned to get protection against snow, wind and water for a long period of time. Also, the cuffs can be adjustable thanks to the Velcro closure and it has waterproof zippers that both effectively prevent any rain infiltration. Description: This item designed by Patagonia does not disappoint. 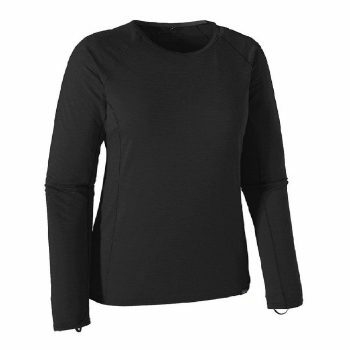 The long sleeved Patagonia Women’s Merino Baselayer is a combination of Merino wool and polyester, which makes it both stretchy and breathable. Since it is very thin, you can easily wear this top under any other clothing garment for increased protection against the elements. If you are wondering how you are going to wash it, you should know the shirt can be machine washed but should be hanged to dry. In addition to this, you don’t need to worry about it shrinking or it taking a long time to dry: the shirt’s material is designed to maintain its shape. The collar of this shirt includes an internal neck tape, which enhances comfort of wear, and it has elastic thumb loops at the end of each sleeve for secure hand coverage. The top is available in a striking blue color that will draw attention and enable you to keep stylish while exercising. The Patagonia top is lightweight and ideal to wear while hiking, running, or simply on a casual day out. Related: We also recommend the Patagonia Down Sweater Vest. It is made of 100% recycled polyester fabric with a water repellent finish that will protect you fairly well against rain. Also, it has hand warmer pockets with resistant zippers and an internal zippered chest pocket. Finally, it has a slim fit that, along with the base layer mentioned before, will give you a warm and comfortable feeling in cold temperatures during outdoor activities. And that wraps up our quick guide on how to choose the best base layers for skiing as well as our top-rated recommendations. As you know, in order to choose a high-quality underwear, you’ll have to pay attention to the seams, fabric, weight and garment features. You might be able to skip the top part, but you definitely shouldn’t miss buying a base layer for your legs, especially if you will go skiing or travel to a really cold winter region. So, did you find a base layer that you can use from our reviewed products? Got more tips for base layer shopping? If so, feel free to share your thoughts in the comments!